I have wanted to post on this for quite a while now, but haven’t made the time. Well today I am going to write a short post on something that we as people deal with every day. It is a bit sensitive to touch on this subject, kinda up there with religion and politics, but I am going to brave it and stand strong in my conviction. Here we go. Men, if you are living with a woman for crying out loud put the freaking toilet seat down after you are done pee-ing. I live with 3 girls, 3 beautiful girls who all sit down when they go pee. How could I possibly think that leaving the toilet seat up when I am the only one in my family who pees standing up is a good idea? This has been joked about, discussed, brought up in daily conversation and we as men are renowned for it around the world. In all seriousness though, it is a disrespectful thing to do to the women in your house. 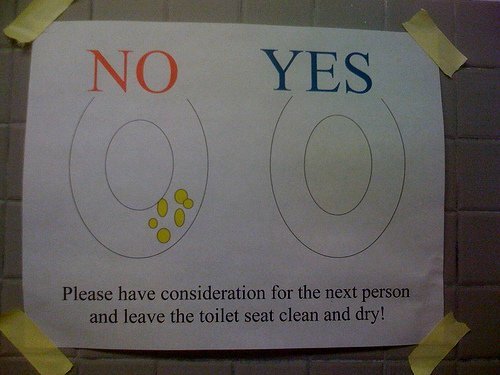 In short, when you pee put the seat down. It is a sign that you are thinking about the women in your house. It is a sign that you love, care, respect and realize that you are not the only one living in your house. Just try it. Most probably the reason that men put the toilet seat up when they pee so that they don’t pee on the seat. Well, does this give you invitation to just leave your pee remnant drops and pubic hair all over the porcelain without cleaning it up? Someone has to bend down, or use their foot to kick the seat down so that they can sit down on that seat. Just clean it up man and put the seat down, this is another sign of thinking of others. Finally, if you do pee on the seat, especially in a public bathroom clean that stuff up. There is nothing worse than walking into a bathroom stall to find pee all over the seat from the dude that used it last. Why should I have to clean up his urine with toilet paper? I have gone into the boy’s bathroom many times with my 4 year old girl so that she can pee. Most of the time I have to wipe someone else’s pee off the seat so that my little girl can sit down, this is crazy. I think this is the most disrespectful thing we can do. Well, not the most, but it is up there. To those of us who call ourselves followers of Jesus, or even those of us that are lovers of people this needs to happen. How is it loving to the maid who cleans your mess off of the toilet in the hotel bathroom? How is it loving to the women in your house to have to clean the toilet and put the seat down after you have used it? How is it loving to the dude in the public bathroom who had diarrhea and is about to explode in his pants to have to wipe your mess off of the seat before sitting down? Just some thoughts that are racing around in my head. Take it for what it’s worth, but I think it’s worth a lot. I know this is a late but response, but still: I had to laugh when I read you go on about the toiletseat, which I mostly agree with, but then this line: “How is it loving to the women in your house to have to clean the toilet and put the seat down after you have used it?” Haha, so loving that there are always women cleaning your toilet.